George Knott and his wife, Eileen, bought a tavern in Gothenburg, Nebraska, in 1951, just after he left active military duty. But Knott, a World War II pilot, was back in the air by 1953, when he was recalled to duty. "He just had to fly," sister Ramona Muntz of David City said Tuesday. Knott, 79, an ardent alumnus of David City High School, died Saturday at his home in Lincoln. A memorial service is planned for 1 p.m. Thursday in Lincoln. After the service, Knott's family will travel to Washington, D.C., for Knott's burial at Arlington National Cemetery. Knott was born on his parents' farm near Abie in 1924. He graduated from David City High School in 1943 but left for the service two weeks before commencement, his sister said. He enlisted in the U.S. Army Air Corps and flew on bomber missions during World War II. After two years out of the service, he returned in 1953 as a First Lieutenant and served another 18 years, retiring in 1971. Knott served as a bomber pilot for the Strategic Air Command and piloted transport aircraft for the Military Airlift Command during World War II, the Korean War and the Vietnam War. He served on bases in Italy, Guam, New Mexico, New Hampshire and Delaware. 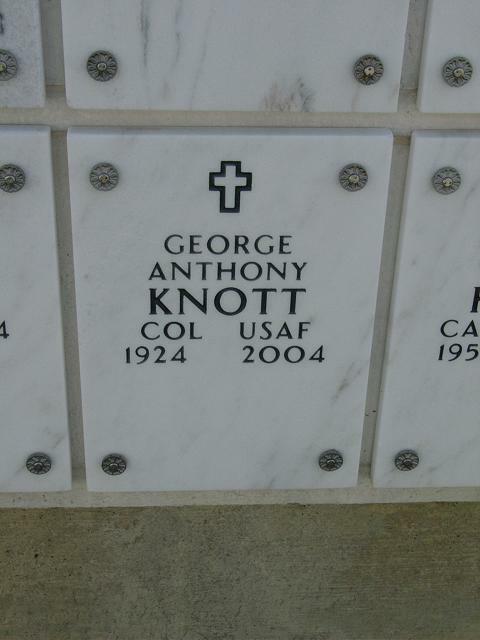 Knott graduated from the Air War College in Montgomery, Ala., in 1969. After retirement, he worked for the Nebraska Department of Aeronautics as a pilot and retired in 1994 as deputy director of operations. His was an Air Force family. Son David died in a helicopter crash, and Kenneth, a brother, died in a crash during a National Guard training mission over Lake Michigan.